Almost a hundred years later, a battered journal—the only evidence left from the night of the Romanovs’ execution—turns up in a rare bookstore. Suddenly everyone’s trying to decipher the location of the Romanov treasure…and people are turning up dead along the way. Enter the Event Group, the most secret organization in U.S. history. Colonel Jack Collins is charged with finding out what really happened to Alexei and Anastasia. To get to the truth, he and his team will have to travel to the continent’s last deep wilderness where men have been vanishing for centuries— and come face to face with a mythical enemy from the dawn of time…. 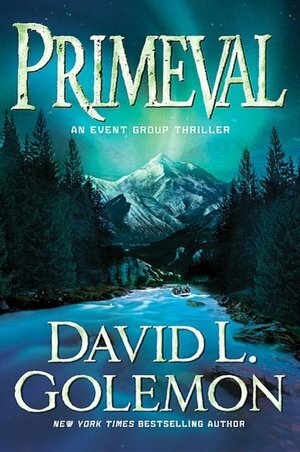 Primeval by David L. Golemon is the fifth book in his Event Group Series. There is a lot of back story to set up for this one. It begins in 20,000 BCE with people and creatures crossing the Bering Strait land bridge. Then jumps to Russia in 1918 where Tsar Nicholas has a plan in place to save some of his children, Anastasia and Alexei. Then the action is back east of Glacier Bay, Alaska. Next it's 1962 and Operation Solar Flare has begun. Finally, before the present day, it's 1968 and the novel follows a group of grad students following the Stikine River in Canada. Finally we are all up to date. In the present day someone is after a treasure connected with the Romanov dynasty. Jack's sister Lynn has been taken captive by the murderous thugs and it's time for the Event Group to step in, figure out what is really going on, and save the day. Even though this all sounds complicated, Golemon moves us pretty quickly through the back story to the present and then the action takes off. Golemon has a large cast of characters in his books and you need to keep track of them as you are reading. Although Primeval could be a stand alone novel, it really helps if you already know many of the characters and their back stories. The Event Series books are all fast, fun reads and perfect escapism. The giant creature stood over eleven feet tall. Its sheer weight alone was equal to eight of the humans it followed. The massive head had a broad brow, indicating the possibility of it carrying a brain near equal to that of a man’s. Its ability to walk upright made the animal quick of foot and steady on uneven terrain. The eyes held the spark of intelligence like no primate before it. The mouth was filled with teeth capable of chewing the harsh grasses, twigs, and bushes of the western continent—being flat and broad—as well as the large, sharp incisors of the meat eater. 1918, Russia: "Two of your children are guaranteed to survive tonight. That is how you must look at this....Tonight, above all else, you must be braver than your reputation." This sounds like a series I'll have to check out!